I LOVE Rhubarb and anxiously await its arrival in the spring. Unfortunately, due to my schedule, it took me until yesterday to go out to my neighbors patch and pick some. I couldn’t decide what to make as I have so many good recipes, but I knew that I wanted to make something that included the raspberries and strawberries that I had bought the day before. This was what I came up with. 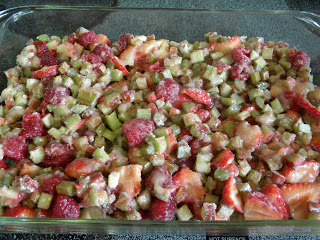 In a large bowl combine the rhubarb and berries, white sugar, 1/3 cup flour, and cinnamon. Transfer to a greased 9×13 baking dish. In another bowl, combine remaining 1 cup flour with the brown sugar, oats and nutmeg. Add butter and blend well to create the streusel. 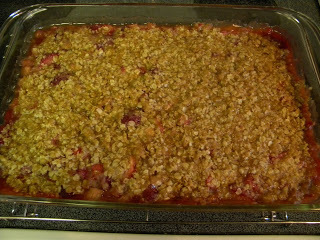 Sprinkle streusel over rhubarb mixture and bake at 350 degrees for 35-40 minutes. I dont see a way to follow you- let me know if I'm missing it! And I hope you will come follow me as well!